Clone Wars Bloopers: Ep. 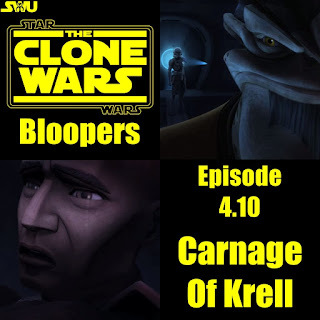 4.10 "Carnage of Krell"
First off, at the start of the episode when Rex confronts Krell about Fives and Jesse, there is a Clone seated to the left of Krell. After Krell declares that they should be executed, the Clone has mysteriously disappeared. ...But Krell parries three blaster bolts, not two. There are *Three* bloopers in this one scene! #1. The floating controls for the elevator change position. #2. At first, Fives is almost directly behind Rex. In the second shot he is standing to the left of Tup. #3. Fives is missing his Kama. When they return to the brig to execute Krell, Fives doesn't appear to have either of his blaster pistols. ...But when Dogma shoots Krell the pistol on the opposite side is gone.. again. At the end of the episode when Dogma is being escorted to a gunship, his hands are cuffed behind him. But just before the Gunship takes off, his hands are in front of him. Big thanks to Ruari for spotting several of the Bloopers seen here. If you enjoyed this edition of CWB please share it with your friends! If I made a faux pas of my own please let me know in the comments below. One word: THRILLER! This episode kept me on the edge of my seat beginning to end. From the 501st and the 212th being tricked into fighting each other, to Waxer's gut wrenching death, to Krell finally showing his true colors, this episode was pure excellence! Bravo Clone Wars crew!! 13/10, Off the chart! !